My friend Danielle had an extra ticket for a Canadian Club luncheon last week and, knowing I'm someone who tries to luncheon on a daily basis, she invited me along. It was a snowy day, but lunch awaited so off to the Chateau Laurier I went. The discussion was on the economy, moderated by Canadian Twitter celebrity economist Mike Moffat. Jobs, trade, housing affordability, policy, all were topics of discussion. But come on, this is a food blog. I know what you're here for. We began with a perfectly servicable salad. Leaf mixed greens, shaved carrots, and so forth. 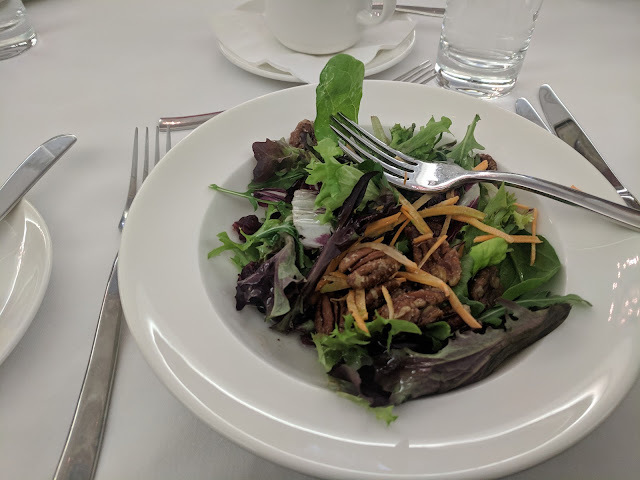 I've come to embrace the trend of salads with nuts -- adds a nice bit of texture and makes it seem more substantial -- the pecans included with this salad were a welcome touch. 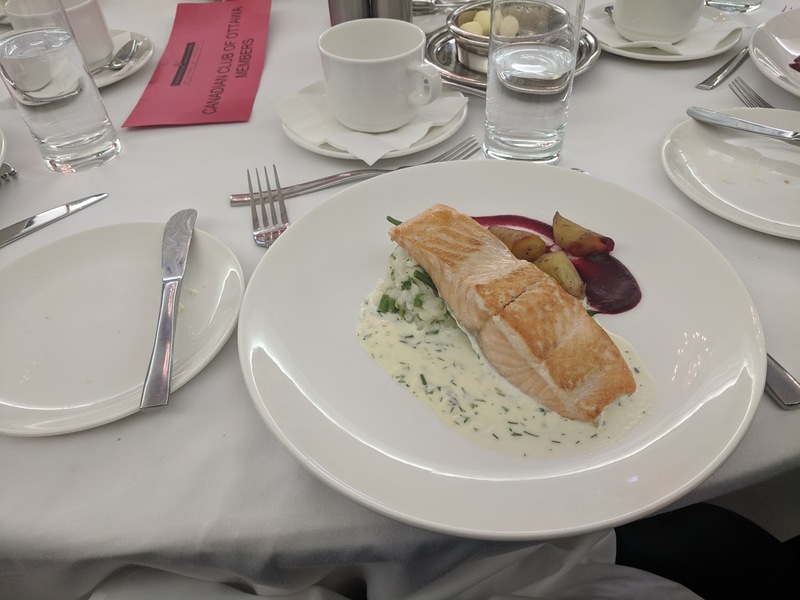 As we discussed the West Block renovation we moved on to the main course, baked salmon with a cream sauce on asparagus risotto, with perhaps a few pieces of turnip or something similar. The risotto was a marked improvement over the last time I had risotto (which I realize I still need to report on, so, spoiler alert I guess), and the combination of the salmon (a known brain food) and the deep discussion of trade policy meant I left the room feeling slightly smarter than when I had entered. 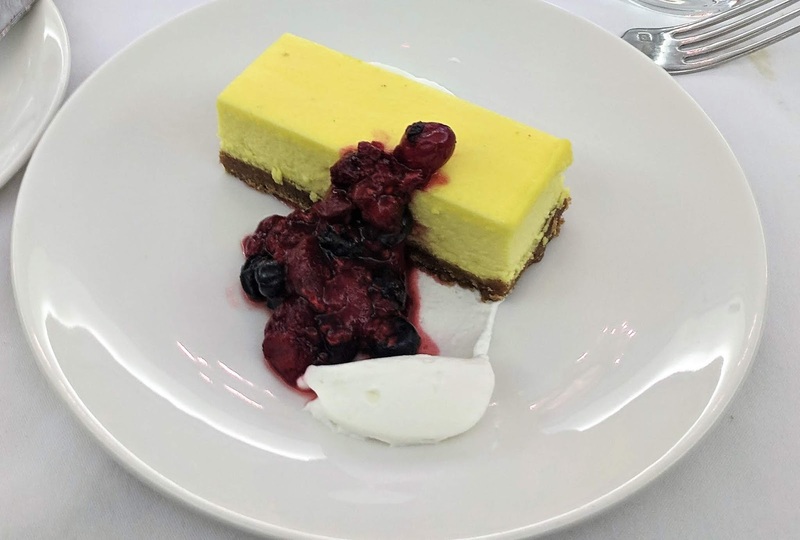 The highlight of ths lemon cake was the mixed berry compote, which says something right there. The cake itself was dry, not particulatly lemony and, while the photo doesn't show it well, unnaturally yellow. Still, I tried to finish most of it in the interests of science before Ubering back down Wellington Street. Oh, and the economy will either be great, bad, or ok. We'll see.